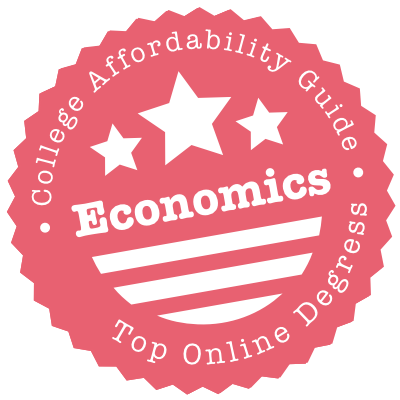 Scroll down to see the top not-for-profit colleges offering economics degrees online. American University has an online Master of Arts in Economics with a specialization in applied economics. The curriculum requires students to complete 10 courses, for a total of 30 credits. One required class is a capstone seminar where students integrate what they have learned in the program. Courses are delivered online in eight-week sessions, and students can complete the program entirely online or take up to six credits in coursework on the American University campus. Students can complete the degree in as few as 20 months. Applicants must have a bachelor's degree, but it doesn't have to be in economics. Students who enter this program must have completed Calculus 1. GRE scores are required. The College of Southern Idaho offers an Associate of Arts degree in economics that consists of 64 credits and can be completed online. The AA degree meets the General Education requirements in all public universities in Idaho. This facilitates the transfer of completed AA credits to a four-year undergraduate program in the same or closely-related field of study. Students can choose to concentrate their studies in two areas - the business economics option or the social science economics option. All students must enroll in the following Economics courses: Principles of Microeconomics, Principles of Macroeconomics, and International Economics. Students who choose the business economics option take additional courses such as calculus, business statistics for decision-making, introduction to financial accounting, and introduction to managerial accounting. Colorado State University's online Bachelor of Arts in Economics allows students to customize the degree to match their career goals. The curriculum requires students to select a minor from options such as business administration, gerontology, or media studies, giving students a second area of expertise that will add to their employability. This is a degree-completion program, and applicants must have college credits to transfer into the program. Students can enter the program in the fall, spring, or summer semester, and the time to complete the program will depend upon factors such as how many credits they have accumulated before entering the program. Eastern Oregon University began offering the online Economics major only since 2014. A 61- to 64-credit program, the Economics major requires the completion of 19 credits (each) of lower division and upper division courses and at least 23 credits of upper division electives, 15 of which must be comprised of upper division Economics coursework. The following courses are required: Principles of Microeconomics/Macroeconomics, History of Economic Thought, Survey Calculus, Social Science Research Methods (or Elementary Statistics and Regression), and Intermediate Microeconomics/Macroeconomics. In addition, students must enroll in two capstone courses (two credits each) in order to graduate. The resulting capstone project should evidence the ability of students to conceptualize and complete original research. A 30-credit minor in Economics is also available online. Majority of the core and support courses required for the Associate of Arts in Economics degree at Foothill College are available online. Students accepted to the program must complete all General Education requirements for the AA degree, in addition to the core Economics courses (18 units) and support courses (12 units). The following core courses are offered online: Principles of Microeconomics, Principles of Macroeconomics, Political Economy, and Introduction to Global Economy. It should be noted that although all these courses are offered online, they are not available every year. Students who are experiencing scheduling problems with the online availability of the required courses for the AA degree will have to consult with an academic counselor to get approval for course substitutions. The College of Business and Entrepreneurship at Fort Hays State University offers a Bachelor of Business Administration degree in international business and economics that can be completed online. The interdisciplinary program is comprised of 124 credits and draws on other fields of study, including sociology, geography, political science, and foreign language, to provide students with a broad-based understanding of global business. In addition to 55 credits of General Education courses and 27 credits of core curriculum requirements, students must complete 39 credits in the major and 3 credits of electives. The curriculum includes coursework in a wide range of business and economics topics such as managerial economics, financial markets and institutions, international finance, business law, and money, banking and the macroeconomy. Franklin University offers a Bachelor of Science degree in business economics that can be completed mostly online. The program consists of 124 semester hours distributed as follows: General Education Core (24 hours), additional General Education requirements (26 hours), business core (28 hours), major area (24 hours), university electives (10 hours), and major electives (12 hours). The curriculum includes coursework that cover emerging topics in the field of economics today such as sustainable economic development, managerial economics, global and emerging markets, economic reporting and analysis, and economic modeling and forecasting. An online Subsequent Bachelor of Science degree in business economics is also available for students with an undergraduate, non-economics degree who are seeking a second bachelor's degree in the field. The online Master of Science in Applied Economics from Georgia Southern University prepares students with analytic skills needed in fields such as economic development, regulatory agencies, and financial institutions. The 30-credit curriculum includes six required courses and four electives, and students can complete the degree in two years without ever coming to campus. Applicants must have a bachelor's degree with a 3.0 or higher GPA and must submit GRE scores. Prerequisites include calculus and statistics, and the program prefers applicants who have also taken intermediate-level classes in micro- and macroeconomics. Students can enter the program in the spring or fall. Undergraduates at Harding University can earn a Bachelor of Business Administration with a major in economics. The curriculum for this program includes 53 credits in liberal arts requirements, 41 credits in core business classes, and 27 credits in the major. Outside the classroom, business students can take part in the Delta Mu Delta Business Honor Society and work with the Center for Professional Excellence to find an internship or mentor. The Center for Business as a Mission reflects the Christian roots of Harding. The College of Business Administration administers more than a dozen named scholarships, which have differing criteria. The Brackett Christian Business Scholarship, for instance, is awarded based on academic performance, leadership, and financial need. Johns Hopkins University has online programs at the graduate level for students interested in applied economics. The Master in Applied Economics is a 10-course program that can be completed entirely online; students can also take classes in Washington, D.C. Online students can choose electives in public policy, spatial economics, environmental economics, health economics, or quantitative methods. Students may also declare a formal concentration in financial economics. This program is open to students with any undergraduate major. Students may attend full time or part time and can start in any semester. The university also offers a four-course online Post-Master's Certificate in Quantitative Methods in Applied Economics for individuals who already have a master's in economics or statistics. The online economics program offered by the School of Public Policy at Oregon State University leads to a Bachelor of Science or Bachelor of Arts degree. The program consists of 180 credits broken down as follows: baccalaureate core (48 credits), Liberal Arts core (15 credits), Economics major (51 credits), BA or BS requirements (15-24 credits), and electives (as needed to reach the total of 180 credits). The economics core curriculum includes courses that cover topics such as public policy analysis, economics of traditional and renewable energy, advanced microeconomic and macroeconomic theories, and economic research. Students can choose to focus on one of three areas: general comprehensive training in modern economics, managerial economics, and law, economics and policy. Online classes are offered asynchronously. The Associate of Arts program in economics offered at Palo Alto College is designed specifically for students who wish to transfer their AA credits to a four-year baccalaureate program in a large university. The degree is available online and students are required to complete a minimum of 60 credits in order to graduate. An interdisciplinary program, the AA in Economics draws from disciplines such as accounting, business, and mathematics to provide students with a strong academic foundation for a bachelor's degree in the field. The curriculum includes courses that cover traditional as well as emerging topics in economics such as the principles of macroeconomics and microeconomics, financial accounting, mathematics for business and social sciences, and economic geography and global issues. Pennsylvania State University offers Bachelor of Arts and Bachelor of Science degrees in economics that can be completed online. Both programs provide students with a firm foundational understanding of the field of economics in areas such as econometrics and macroeconomic and microeconomic theory. The Bachelor of Science in Economics degree focuses on quantitative analysis, with courses in calculus and statistical analysis, as well as in computer programming and in money and banking. Students who are more interested in qualitative analysis are advised to consider the Bachelor of Arts program with its emphasis on growth and development, labor economics, and international economics. In addition, the Bachelor of Arts degree requires students to complete a foreign language requirement comprised of 12 credits. The Krannert School of Management at Purdue University offers a fully online, 30-credit Master of Science in Economics degree that is specifically designed for students with a strong analytical training, such as an undergraduate STEM degree. Students take a common core of courses during their first year in the program and enroll in courses in their preferred area of concentration during the second year. There are two concentrations available - applied economics/business, for students seeking managerial positions post-graduation, and advanced economic theory, for students who plan to continue on to doctoral studies. The MS degree is also offered as a hybrid program. Students who choose this option are required to come to campus during the second year to complete their coursework. Outside of general education credits, the Bachelor of Science in Business Administration with a concentration in Economics at Robert Morris University is comprised of five types of courses. Students devote six credits toward statistics and ethics; 27 credits to business foundations coursework in accounting, management, finance and marketing; 24 credits to the Economics concentration; 12 to upper-level Business Administration electives; and 15 credits of electives outside their area or in internships. There is no capstone or thesis. The Master of Science in Applied Economics degree offered at Southern New Hampshire University consists of 36 credits and is available online. The program can be completed in five terms and has a concentration in environmental and natural resources economics. Courses are offered asynchronously. The curriculum includes coursework that cover a variety of topics in modern economics such as multinational corporate finance, fiscal and monetary policies and practice, and investment analysis and portfolio management. The university offers a Master of Business Administration (MBA) in Economics degree that can be pursued online as well. The program focuses on managerial economics, mathematics and statistics for economics, and micro- and macroeconomics theory and analysis. An International MBA in Economics degree is also available online. The Associate of Arts in Economics is a fully online program offered by the Online Campus of Tyler Junior College. The program is comprised of at least 60 credits, which is made up of required and elective Economics courses as well as coursework prescribed by the core curriculum (communications, mathematics, life and physical sciences, creative arts, etc.). Most students complete the program in two years. The Economics core includes courses in the principles of microeconomics, elementary statistical methods, and mathematics for business and social sciences. Tyler Junior College has articulation agreements in place with several Texas public colleges and universities that facilitate the transfer of AA credits to a four-year bachelor program in the same or closely related field. The University of Detroit Mercy offers two online economics programs on the graduate level - Master of Arts in Financial Economics and Master of Arts in Economics. All students must complete the same core economics courses (15 credits) before enrolling in the classes that focus on their preferred area of emphasis. The required courses are: Economic Analysis of Enterprises, Analysis of Economic Conditions, Quantitative Foundations of Economic Analysis, Financial Economics, and Theory of International Trade. The financial economics program focuses on the U.S. and international systems of banking, capital markets, investments, and policies. The general economics program provides students with an in-depth understanding of international economics and how it influences the U.S. economy. A thesis option is available for both programs. The University of North Dakota offers a Master of Science in Applied Economics (MSAE) degree through the College of Business and Public Administration. The MSAE program is accredited by the Association to Advance Collegiate Schools of Business (AACSB). Most students earn their degree in just over two years. The program can be pursued entirely online and classes are held synchronously. Thesis (31 credits) and non-thesis (32 credits) options are available. All students are required to enroll in the following courses: Economic Forecasting, Mathematics for Economists, Advanced Price Theory, Econometrics, Applied Economic Analysis, Advanced Macroeconomic Theory, and Applied Economics Research Seminar. Qualified students have the opportunity to participate in faculty-led research projects in areas such as international economics, public finance, and labor economics. The Jon M. Huntsman School of Business at Utah State University offers Bachelor of Science and Bachelor of Arts degrees in economics that can be pursued online. Although students admitted to the Bachelor of Arts program are not required to select an area of emphasis, the following options are available: economic theory, managerial economics, prelaw economics, and international economics and trade. The online Bachelor of Science in Economics degree does not offer an area of emphasis. Bachelor of Arts students also have to complete the foreign language requirement of the program. A dual major in economics and accounting is available for both the BA and BS degree options. The accounting program however, is not available online at the current time. The online Master of Arts in Financial Economics degree at Youngstown University is a 30-credit program that provides students with a firm foundation in economic theories and principles, as well as in financial markets analysis. In addition to a bachelor's degree from an accredited college (with a grade point average of at least 2.7), applicants must have completed a minimum of one course in statistics, calculus, principles of microeconomics, and principles of macroeconomics. Required coursework for the degree (18 credits) includes classes in econometrics, micro- and macroeconomic theories, finance for decision making, and the economics of financial markets and institutions. Students must also take three electives, two of which must come from Economics and one from Economics or Finance. Change is coming! Colleges are gradually beginning to offer online economics degrees in the same majors you’ll see on-campus – economics, business administration with a concentration in economics, international business economics and even economic crime investigation.